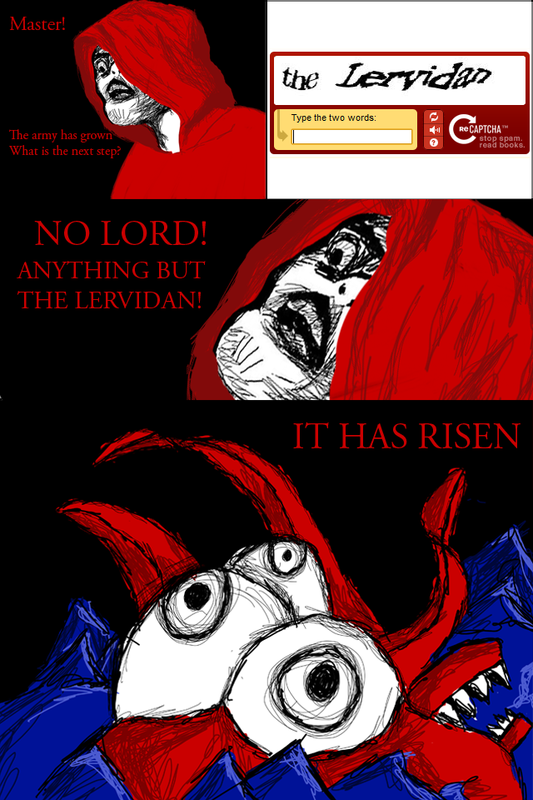 The Lervidan is an aquatic beast under the command of Inglip. The single depiction of the Lervidan comes from an etching by Leminnes, dated to the holy day of Troplas in the year 2011. It is unknown if the only extant depiction of the Lervidan shows only the beast's head, however, it is known that the creature is red, has three gigantic eyes, a gaping beaked maw, and an unverified number of tentacles. Based on these characteristics, some have classed the Lervidan as a cephalopod. Inglip has apparently imprisoned the Lervidan, banished it, or restrained it based on the depiction. It is not known why He has done so, but it is known that the Lervidan is used to punish or destroy the Dark One's enemies. Among gropagas, the Lervidan is a polarizing creature. It is simultaneously revered and feared for its great power, but some see it as an allegory of Inglip's immeasurable strength—if Inglip was able to tame such a creature, then surely he must be all-powerful. The holiday of Turcan was extended in the year 2011 because of the Lervidan's release. Inglipnomicon Wiki is a FANDOM Lifestyle Community.